Subject to Resolution by Annual General Meeting or Special General Meeting, the club shall be affiliated to the Cornwall Photographic Alliance' (CPA), and or the Photographic Alliance of Great Britain' (PAGB), through the 'Western Counties Photographic Federation' (WCPF). To promote and foster all aspects of photographic endeavour amongst members. To support and encourage individuals whether novices or workers in the field. To maintain a friendly, positive atmosphere for the benefit of all members. To encourage visits by individuals and groups to and from clubs and associations with similar interests. To organise competitive and non-competitive events for the participation and enjoyment of all members. 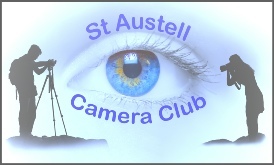 Membership of the club shall be open to any person above the age of 14 interested in, or practicing photography, as an amateur or professional, who actively supports the Clubs objectives. Any person under the age of 18 [Youth member] wishing to become a club member must first provide the signature of a parent or guardian giving approval to the application. Honorary Membership may be granted at the discretion of the committee. Honorary and Youth members may participate in all club functions and activities but cannot vote, hold office or serve on the Management Committee. Youth members may however enter SACC competitions. A parent or guardian must accompany youth members at all club activities, excepting that youth members, who are at least 16 and have provided a parent or guardian’s written approval, may attend regularly scheduled meetings alone. Upon recommendation by the Committee Life Membership may be granted to any person for their photographic contribution to the club activities over a lengthy period. The award of lifetime membership requires the support of a majority of the current members. Life membership entitles the holder full membership rights for the lifetime of that member without the requirement to pay membership subscriptions. Membership of the club implies an undertaking to comply with and abide by the rules and constitution of the club. The committee shall have the power, after due consideration, to terminate membership. All subscriptions shall be determined at the Annual General Meeting, and shall be payable at the start of each Season. Receipts shall be issued by the Honorary Treasurer. Youth members and members joining on or after the 3rd December (i.e. mid-season) may pay a reduced subscription at the discretion of the Honorary Treasurer Management Committee. The club shall maintain Insurance cover in accordance with the recommendations of the PAGB. 7.1 The affairs of the Club shall be conducted by a management committee consisting of: President, Vice President, Honorary Secretary, Honorary Treasurer, Honorary Competition Secretary, Club Liaison Officer, and such named Officers as may be deemed necessary and up to five ordinary members. 7.3 With the exception of Honorary or Youth members every member is eligible to be nominated to serve on the Committee in their chosen capacity provided that their nomination is received by the Hon Secretary by 8:00 pm two weeks immediately preceding the Annual General Meeting. 7.4 Where a post is formally contested at the AGM the nominations will be subject to a secret ballot amongst those members attending the AGM together with any proxy votes cast. A Committee Officer who has already completed two years in office will still be eligible to continue in post on an annual basis. Ordinary members initially serve for twelve months but are eligible for nomination on an annual basis. 7.6 In the event of limited committee numbers an officer may serve in more than one capacity. 7.7 Should any member not be available to attend the AGM they may elect a proxy vote in advance to be added at the AGM. Committee meetings shall be convened at the request of the President or at least two other Committee Members. All committee members shall be given notice of meetings. The Committee shall be given the power to form sub-committees for special purposes and may co-op up to two ordinary members to serve on such sub committees. The President and Vice President shall be ex-officio members of all sub-committees. A minimum of five members shall form a quorum at committee meetings. At Annual General and Special Meetings one third of the total membership shall form a quorum. The Annual General Meeting shall be held towards the close of each season. Business shall include the minutes of the previous AGM, Annual reports from the Officers, a statement of Accounts, the election of Officers and Committee Members, and Any Other Business at the Chair person's discretion. Each member shall have one vote. The Chairperson may exercise a casting vote if necessary. A Special General Meeting may be called by the President or on receipt of a requisition signed by not less than one quarter of the membership. Such requisitions must contain full details of the matters to be discussed. At least seven days notice shall be given. All monies received on behalf of the Club shall be kept in safe custody by the Honorary Treasurer. Cheque's drawn on any account which may be held by the club must be signed by the Honorary Treasurer and one of the following Officers, President, Vice President, or Honorary Secretary. Amendments to the Constitution shall be made at the Annual General meeting, or at a Special Meeting convened specifically for this purpose. Notices of any proposed amendment shall be given in writing to the Honorary Secretary at least fourteen days before the meeting. The nature of the complaint should be notified in writing to the President or the Vice President who will informally try to resolve the issue. If the complaint cannot be satisfactorily resolved in this way, the Committee will investigate the nature of the complaint and give a ruling. The result of any such ruling shall be binding upon all parties. In the event of anything occurring not provided for, or not clear in the foregoing rules, the Committee shall have the power to deal with such matters at its discretion. In the unlikely event of the dissolution of the Club, all surplus funds shall be transferred to such organisations, that the Committee shall in its absolute discretion decide. In the event of such a decision, all assets of the Club are to be realised and transferred as outlined above, subject to payment to any outstanding debts incurred by the Club or its members or Officers in connection with the operation of the Club. The Club may be dissolved only by of three quarters of the membership present at a Special Meeting called for that purpose. Such a meeting shall appoint a Liquidator to handle the disposal of the funds and assets.